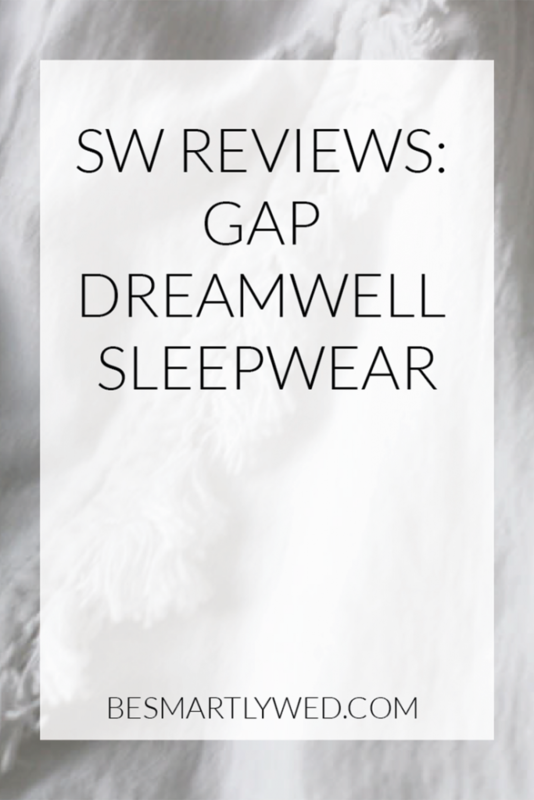 If you’re looking for some warm-weather loungewear / pajamas – for your honeymoon, perhaps, or even just a humid night at the shore – don’t miss the Gap DreamWell collection! Kim has a few of these pieces with her right now in Lake Como, so we thought it was a perfect time for a review. A bonus: much of the collection has been marked down, and some pieces remain available in all sizes! Some of the negative reviews of this line complain about their unsuitability for wearing out and about. The name “DreamWell” tipped me off that this was probably not their intended purpose; indeed, that’s the case, given the sheerness of many of the fabrics. These tops and bottoms would be great for sleeping and lounging, or maybe as cover-ups for a day at the beach. In turn, I’ll go through bottoms (pants and shorts), tops, and a nightgown from the DreamWell collection. For reference, there are two main fabrics in the DreamWell line: a crinkled gauzy fabric (in solid white and a blue railroad stripe), and a smoother fabric that comes in various patterns (blue floral, blue tiled, blue and pink stripe, white with blue patterns, and so on). Also, these pieces really did come as wrinkled as they look in the photos: If you’re concerned, the wrinkles have largely come out of the things I’ve kept, without washing or steaming, but wearing them introduces a new set of wrinkles. 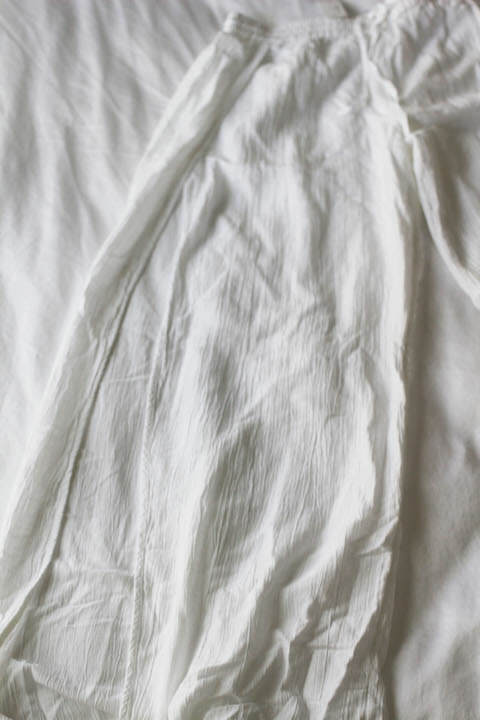 I love the crinkle sleep pants * – they’re so light and easy. I’ve been wearing mine around our rental apartment in Laglio (which has a grassy patio that overlooks Lake Como), and they’re perfect for the warm weather. 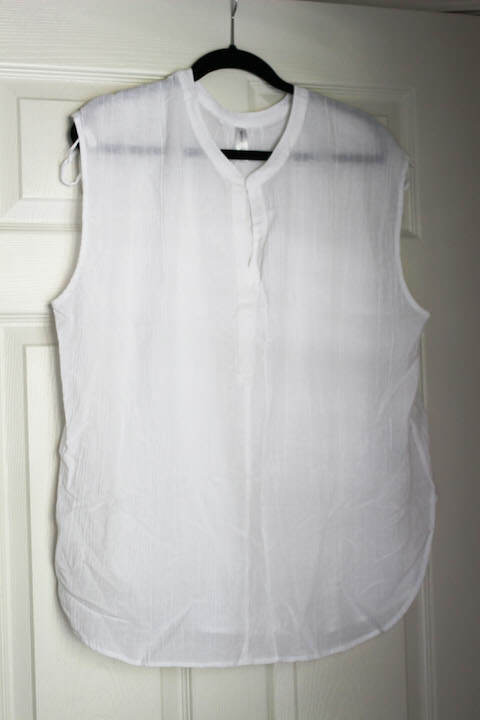 Though sheer, the fabric feels more substantial than some gauzy fabrics do (see the below photo for a close up of the fabric). The side slits aren’t as dramatic when you walk around as they are when you sit (I’ve tried to capture the opening in the photo below). I’ve seen lots of beach pants in this style, so you could easily throw these on over your swimsuit. If you’re not sure about the leg openings, it seems possible to sew up part of it so the opening starts mid-thigh. I typically wear a 30 / 10 in Gap pants sized as such, and a medium in Gap pants that don’t have numerical sizing, and took a medium in these. The waist is comfortable (if anything, a bit large). The pants are definitely shorter on the model than on me (I have about a 29” inseam), as mine hit the tops of my feet, even though I’ve also had to pull the waistband up fairly high. The tassel railroad stripe sleep pants * look to be the same style, though I didn’t love this pattern (reviews of the shorts & top below), so didn’t order these to try. 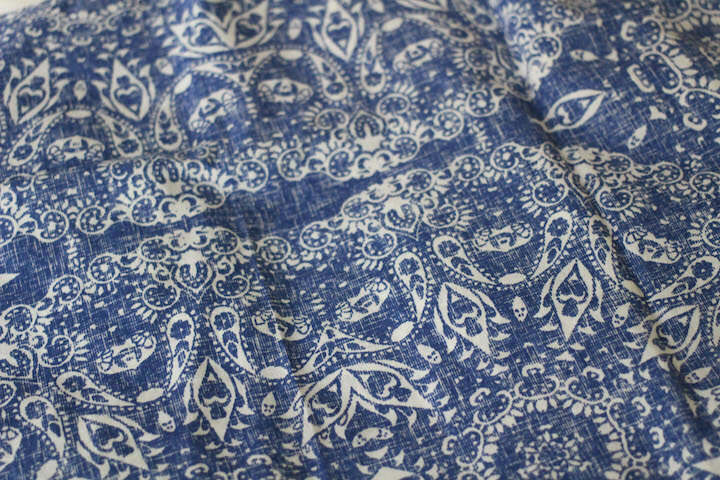 I also took a medium in the DreamWell sleep pants * (which I have in the casitas tiles print, shown in the detail shot below). On me, they’re straighter (but not tight) through the thigh and come to the top of my feet, as the white crinkle pants do. The fabric is smooth and light, though I wouldn’t call it “soft” (as in, if you touch it, you won’t say, “oh my goodness, this is soft.”) The tiles pattern isn’t see-through, though I imagine the bamboo print might be (I haven’t seen it in person), and the pink and blue stripe could be, as well. I typically wear a medium in Gap pajama bottoms, so ordered the DreamWell stripe sleep shorts * in a medium, and they were uncomfortably tight at the bottom (in the photo, you can see there’s a band of sorts that’s a little narrower than the legs themselves). I didn’t love the railroad stripe (I thought it looked a bit dingy) so didn’t try them in a large. 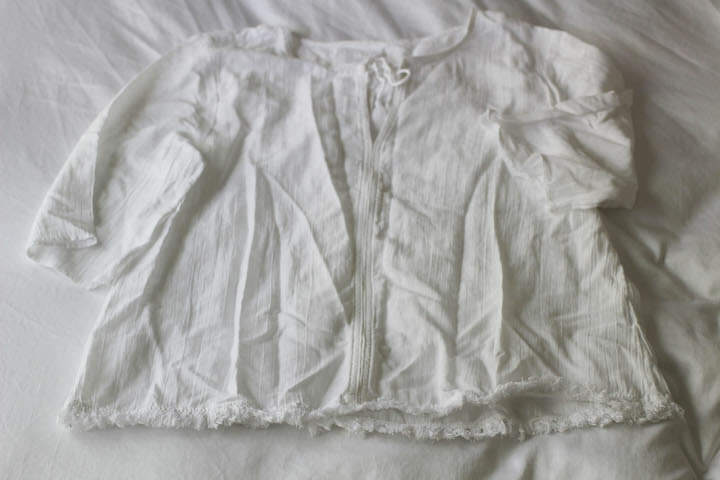 These, like the white side-slit pants above, are a crinkly, gauzy fabric (though the white pants are listed as 10% linen, and these are only rayon / cotton). The blue railroad stripe isn’t as obviously sheer as the solid white in this fabric, but is still too sheer to wear these as regular shorts. 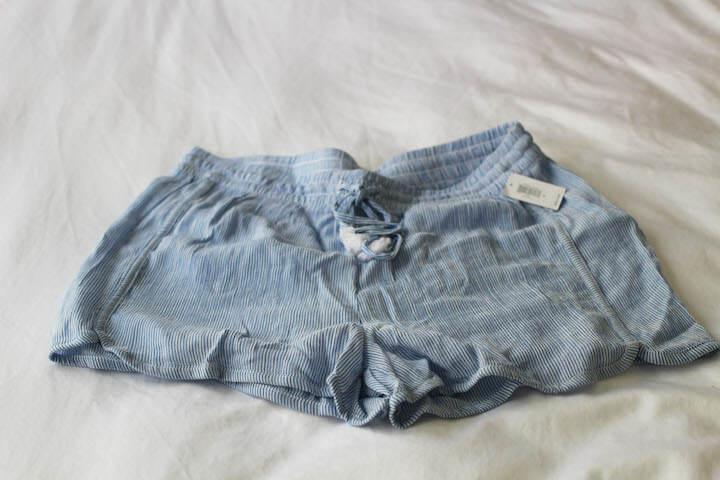 If you like the dolphin hem look, there’s another pair of shorts in this style, but a different fabric: the dolphin sleep shorts *, which are made of the same smoother fabric as the printed pants. 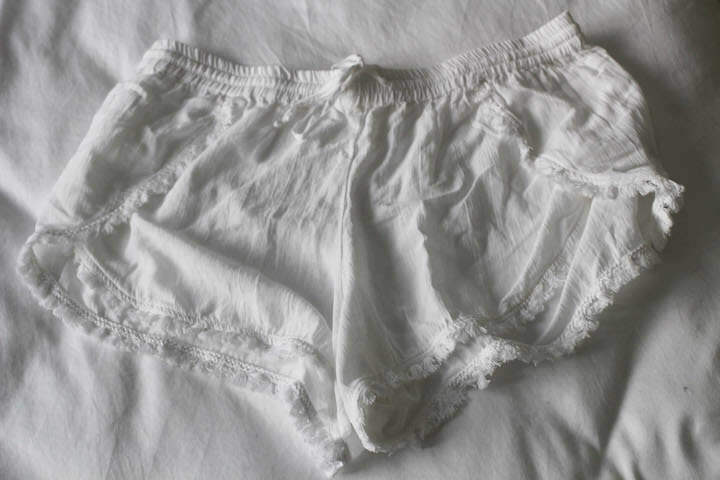 I initially ordered the fringe sleep shorts * in a medium, but those sold out and were never sent; I re-ordered in a large, and they fit comfortably, so I kept them. Based on this style, and the railroad stripe shorts above, I’m inclined to believe the shorts run a bit smaller than the pants. 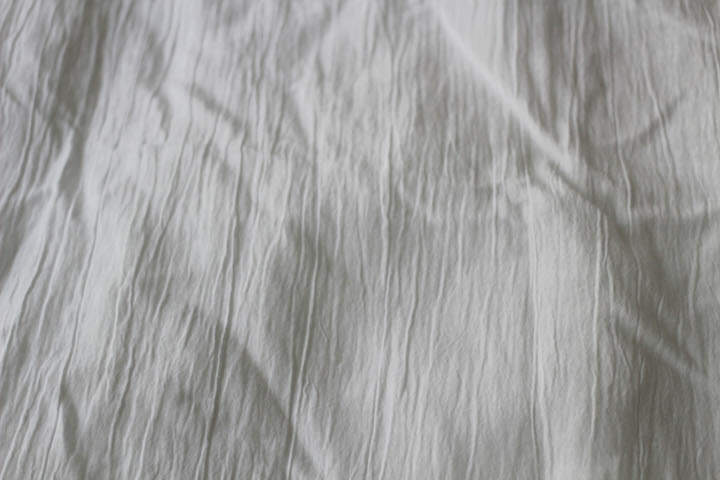 The fabric is the same as the crinkle pants (light and comfortable). The shorts also have the same overlapping design, though the pants moved around a lot more when I walked, relative to the shorts, which mostly stayed as they were. These shorts hit me at upper/mid-thigh, so might be too short for taller ladies (one of the reviewers says they’re far too short for her, but doesn’t mention how tall she is). I’m not sure how the fringe details will hold up in the wash, but I decided to keep them anyway. I thought the tassel sleep top * looked adorable with the fringe shorts on the Gap website. The fringe detail on this top is the same as on the shorts (a close up is shown in the previous photo). I typically wear a large in pullover styles from Gap, but this was way too small in the chest to be comfortable. The shirt was more cropped than I expected from the photo (I don’t have a long torso, so tops aren’t usually short on me), and boxier, as well. It felt like a weird hybrid of “shirt I’d wear to bed” and “shirt I’d wear out,” without doing either one successfully. If you try this style, I’d suggest sizing up (and possibly ordering your regular size for comparison, too). The split-neck sleep top * looked cute on the model, but more closely resembled a hospital gown on me (I’m guessing the shirt has some cleverly-arranged fabric in the photo). A large fit better in this style than in the tassel top, above, with more room in the chest and a longer length. The cut was a miss, though, and I also tend to stay away from cap sleeves. You can see the sheerness of the fabric in the photo below. There were ties at the shoulder on mine, but these aren’t mentioned or pictured on the Gap website (you can see them in the above photo). I double-checked to confirm that this was, indeed, the shirt I ordered, and it was. You can see these ties in the railroad stripe version (the DreamWell stripe sleep top *) on the Gap website. When I think of a “swing” shirt, I expect something more a-line or trapeze in cut. 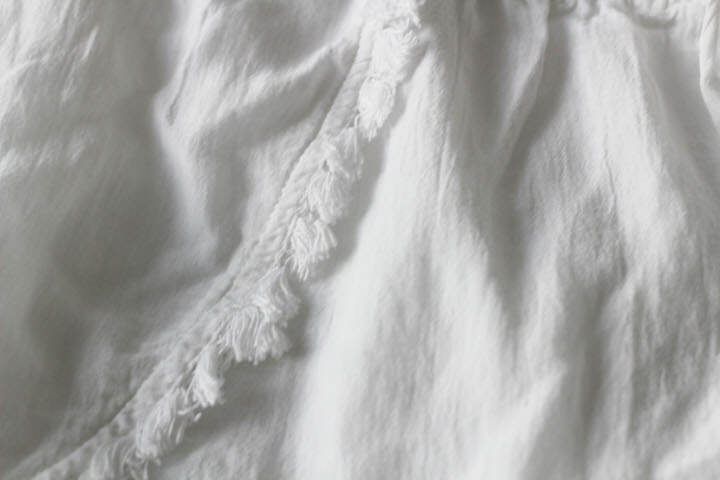 The swing sleep cami *, on the other hand, gets the “swing” from the piles of fabric that make up the ruffled bit. On the model, the top of the cami looks sheer, vs. the bottom, and that’s a result of how much fabric there is. This style comes in both the solid white and the railroad stripe blue, both shown in the photo below. I ordered these in my usual Gap large, which worked well. Shirts in this style usually end up with a seam hitting me at mid-chest, a rather unflattering look, though this seam fell where it was supposed to. The cami was just long enough to hit the top of my pants, but might be too short for someone taller than me (I’m 5’3”), or with a long torso. I usually need to tighten straps on tops like this, but the swing cami isn’t adjustable. You can see how the straps are attached in the photo, and more clearly in the photo on the Gap website (they come together in a racerback style, and though the strap can move through the little loop, you aren’t able to adjust the length of fabric, so the loop seems useless). If you like this top, but have the same issues I do with strap length, it would be simple to stitch up a bit of the straps — an annoyance, but an easy fix. My favorite of the DreamWell tops! I ordered the DreamWell sleep cami * in the casitas tiles print (same as the print for the pants, earlier in the post), and am considering picking up another pattern. 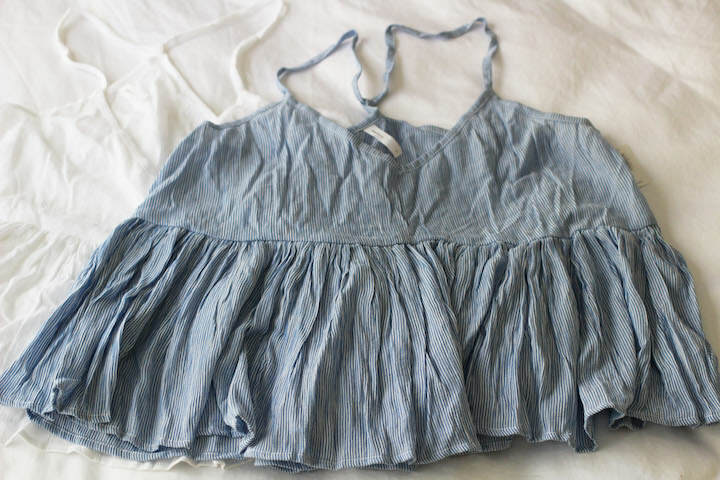 It looks like an apron-style top, but fit me much better than those styles tend to do. I ordered a large, which is very comfortable and fits me as it does the model (not snug, but not oversized). 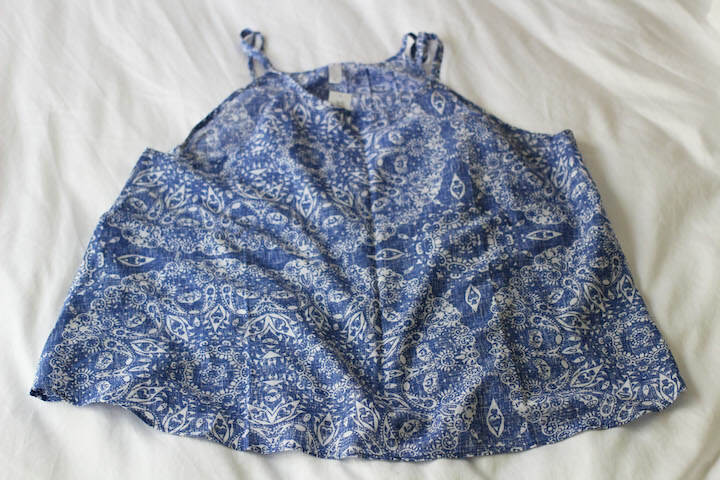 The front of the cami hits at my hips, while the back hem is longer and curved. The straps split into two in the back (you can sort of see this in the photo of the cami on the Gap site), which is a cute detail I didn’t expect. As of writing, it’s available in all sizes in all three prints (my pattern, plus a white with blue bamboo print, and a white with a blue ikat print). Mine isn’t see-through at all, though the other two colors may be. 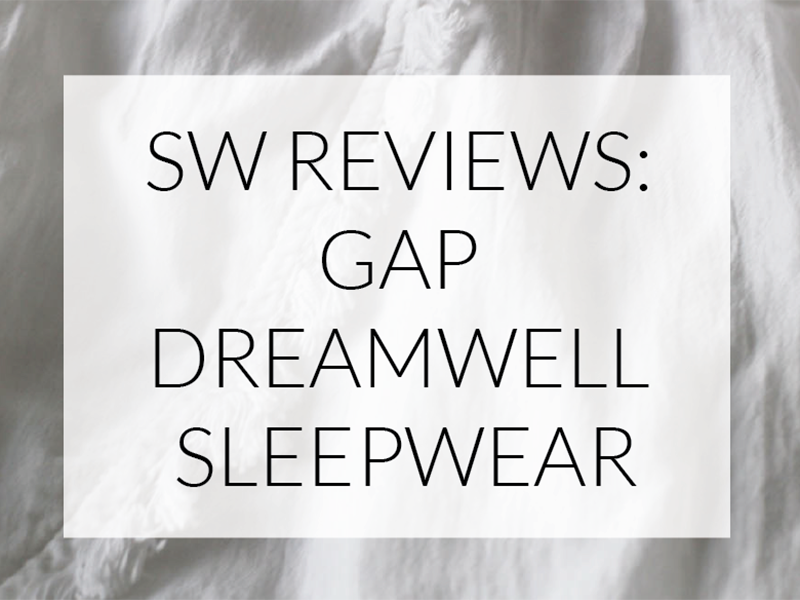 Overall, I’m a fan of the DreamWell line, and hope Gap brings back new pieces next summer! I liked both types of fabric, and while not all of the items were flattering on me, there weren’t any huge misses; I expect all of them could work for someone. There are more recent additions to the DreamWell collection (button-front sleep shirts and nightgowns) that I haven’t personally tried, in different colors and an entirely different fabric (listed as 100% viscose, vs. a cotton/rayon or cotton/rayon/linen blend). Have you tried any of the DreamWell sleep / lounge pieces? Let us know what worked and what didn’t – and, if there are any honeymoon-esque items you’d like us to feature, please leave a comment or e-mail us!